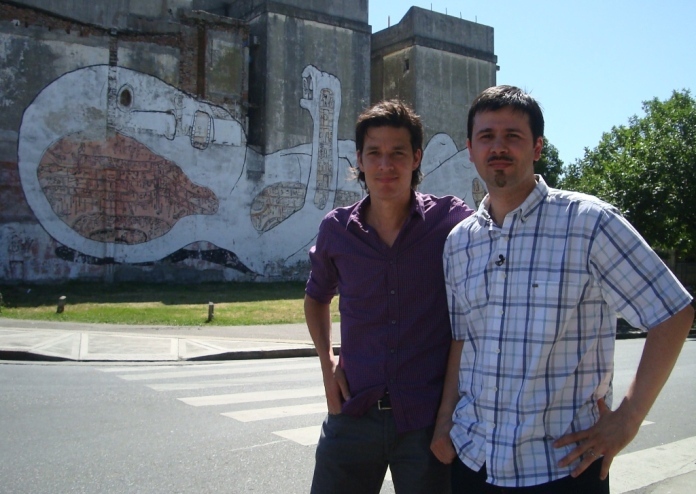 BA Street Art’s Matt Fox-Tucker, author of Textura Dos Buenos Aires Street Art, talking about Buenos Aires graffiti in a feature called Muros que unen on the award-winning Argentine TV news programme Telenoche. More more information about Textura Dos: Buenos Aires Street Art go to the Books section on our website. The hardback book is bilingual (English and Spanish) and includes photographs of murals and stencils by more than 70 different artists painted on the streets of Buenos Aires. It’s also available in selected bookshops in the USA, Brazil, Canada, Europe and Argentina. This entry was posted by admin in News, Videos and tagged Canal 13, grolou, Matt Fox-Tucker, Muros que unen, Santiago de Rego, Telenoche, Textura Dos, video, youtube. Hola! acabo de ver el video y aparece una amiga. Te doy la bienvenida la gran barrio Matt!